For almost 10 years, the Global Competitiveness Index (GCI) has been used by the World Economic Forum to assess the level of productivity of an economy, which determines its long-term growth potential. This appendix presents the results of an empirical analysis that supports the validity of the GCI as a sound estimate of the level of productivity. It must be said from the start that measuring the level of productivity of an economy is a difficult task. The seminal work of Solow (1957) provided a methodology to estimate the growth rate of productivity, known as “total factor productivity (TFP)” or “Solow residual” in the academic literature. This estimate of productivity growth is traditionally calculated as the difference between the actual growth rate of gross domestic product (GDP) and the part of that growth rate that could not be accounted for by the accumulation of physical capital and human capital. This methodology, however, cannot be used to estimate the actual level of productivity, which is the aim of the GCI. Despite this difficulty, Hall and Jones (1996) have shown that around 89 percent of the variation in GDP per capita is due to variation in the level of productivity. As a result, GDP per capita can be used as a proxy for the level of productivity of a country. 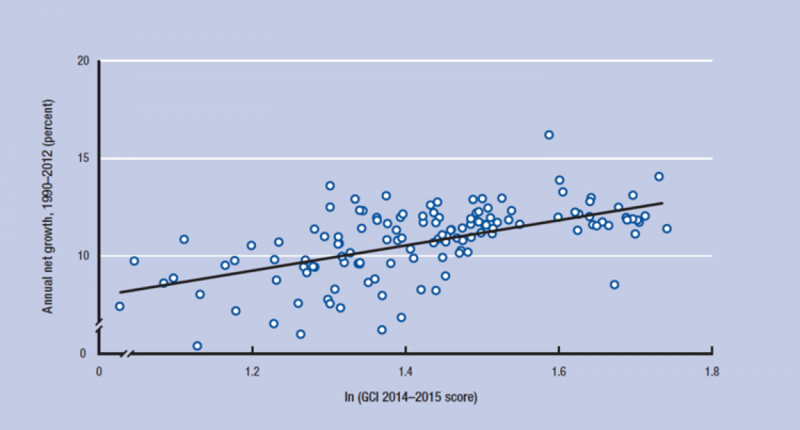 Figure 1 illustrates the strong and positive relationship between GDP per capita and the GCI. The bivariate model, in which we regress the log of the level of GDP per capita on the GCI score, reveals that about two-thirds of the variation in GDP per capita can be explained by the GCI. Source: World Economic Forum; IMF World Economic Outlook Database April 2014. Another way to check the relation between the GCI and the level of productivity of a country is to look at the relation between the GCI and the growth rate of that country. Indeed, most economic growth theories predict that the growth rate will be directly related to the level of productivity, which, in turn, determines the rate of return of investment in an economy. As a result, most theories would predict the GCI to be positively related to an economy’s growth rate. However, estimating a bivariate relation between the growth rate and the GCI would be a mistake. The reason for that lies in what economists call the “conditional convergence effect,” which posits that, all other things being equal, there is a natural tendency for poor economies to grow faster—a phenomenon known as conditional convergence.1 In other words, if all countries had the same investment and population growth rates and the same levels of productivity, then we should observe poor countries growing faster than rich ones. Conversely, if all countries had the same level of income, then those that were more competitive would experience higher rates of long-term economic growth. In reality, however, countries differ both in their levels of income and their levels of productivity, and therefore it is very hard to predict the relationship between the growth rate and the level of productivity with a bivariate correlation analysis that includes the initial level of income. As an alternative, we can calculate the correlation between the GCI and GDP growth (once the conditional convergence effects have been discounted). In order to do that, we need to estimate net-of-convergence growth rates; these rates would be more closely affected only by the level of productivity across different economies. If these net-of-convergence growth rates are positively related to the GCI, it will indicate that the GCI is a good estimate of the determinants of productivity. 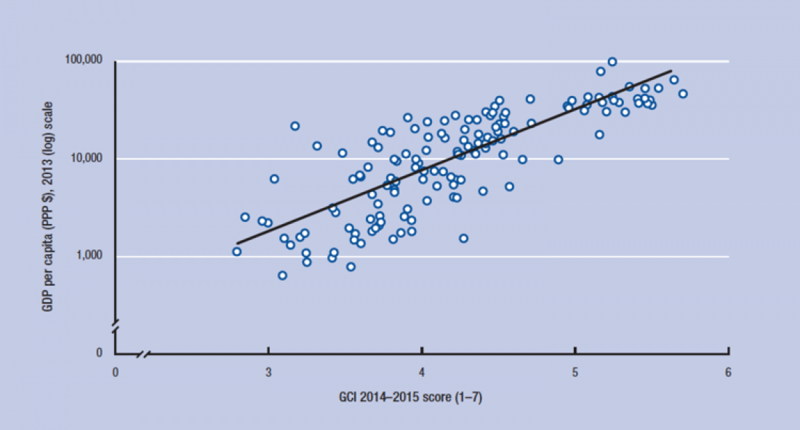 Figure 2 plots this “net growth rate” against the natural log of the GCI score, revealing a positive and strong correlation, which is consistent with the view that the GCI is a good proxy for the level of productivity or competitiveness of an economy. Source: World Economic Forum and World Bank, World Development Indicators (accessed August 18, 2014). Note: See text for details. N = 132 economies. In conclusion, the results of both Figures 1 and 2 indicate that the GCI is a good estimate of the level of productivity. In other words, the GCI’s estimate of the determinants of competitiveness—which, in turn, fundamentally shape the (conditional) medium to long-run growth rate of an economy and its level of prosperity—is validated on a statistical level. Barro, R. and X. Sala-i-Martín. 2004. Economic Growth, 2nd edition. Cambridge: MIT Press. Hall, R. and C. Jones. 1999. “Why Do Some Countries Produce So Much More Output Per Worker than Others?” The Quarterly Journal of Economics 114 (1): 83–116. IMF (International Monetary Fund). 2014. World Economic Outlook Database, April. Available at http://www.imf.org/external/pubs/ft/weo/2014/01/weodata/index.aspx. Solow, R. 1957. “Technical Change and the Aggregate Production Function.” Review of Economics and Statistics 39 (3): 312–20. World Bank. 2014. World Development Indicators 2014 database. Available at http://data.worldbank.org/products/wdi. 1 The reason that poor economies do not grow systematically faster is that “other things are not equal.” Among those other things that are not equal, we find the level of productivity or competitiveness, as defined by the World Economic Forum. 2 A growth convergence equation can be derived, for example, from the basic neoclassical growth theory as seen in Barro and Sala-i-Martín (2004). 3 This is done by adding the term b × ln (yit) from both sides of Equation (1) and using the b estimated in Equation (1). GDP per capita in constant 2011 international dollars were used for the computation.